From when I was a new freshman in my dorm to now my family of four, a microwave has always been a staple of my kitchen. It’s a popcorn maker on movie night. It’s a dinner-maker when the kids have practice in twenty minutes. And it’s a lifesaver when those leftovers just need a little warming up. But this kitchen essential comes in many shapes and sizes. The best microwave is the one that works well for what you need when you need it. 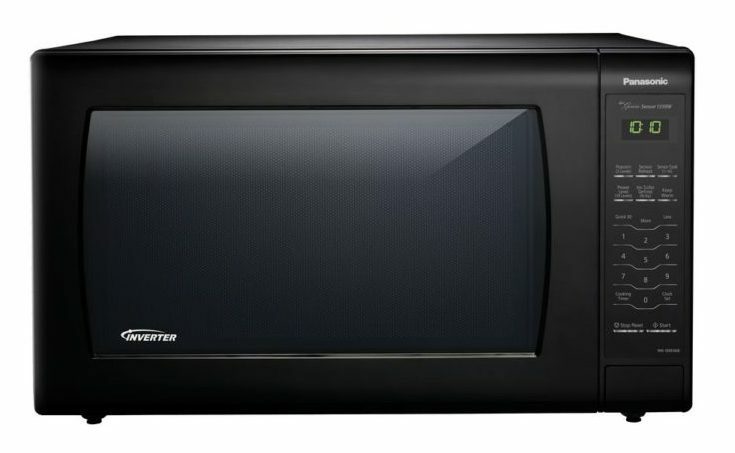 As someone who has had years and years of experience with a microwave, I know what to look for. I’m going to share my favorites. All of the candidates for best microwave have one key factor: ease of use. The Panasonic 651B is a perfect blend of ease of use, high performance and outstanding features. The Panasonic 651B has 1.2-cubic-feet of feet of capacity and has a 13.4-inch turntable. The smaller size allows cooks to devote less space to a microwave and more to other kitchen essentials. That’s one of the reasons I love this microwave. At only 23lbs, the Panasonic 651B is smaller than some of its competitors. However, the Panasonic 651B doesn’t sacrifice power when it comes to cooking. At 1200 watts, the Panasonic 651B cooks evenly and thoroughly. The consistent cooking is due to the Panasonic 651B’s Inverter Technology. This patented technology “generates a seamless stream of power and delivers consistent, evenly prepared food without overcooking; advanced Inverter Turbo Defrost speeds up defrosting time.” This feature ensures you can melt butter, reheat chicken and everything in between without worrying about scorching or uneven cooking. The Panasonic 651B may be smaller but that doesn’t mean it lacks for features. 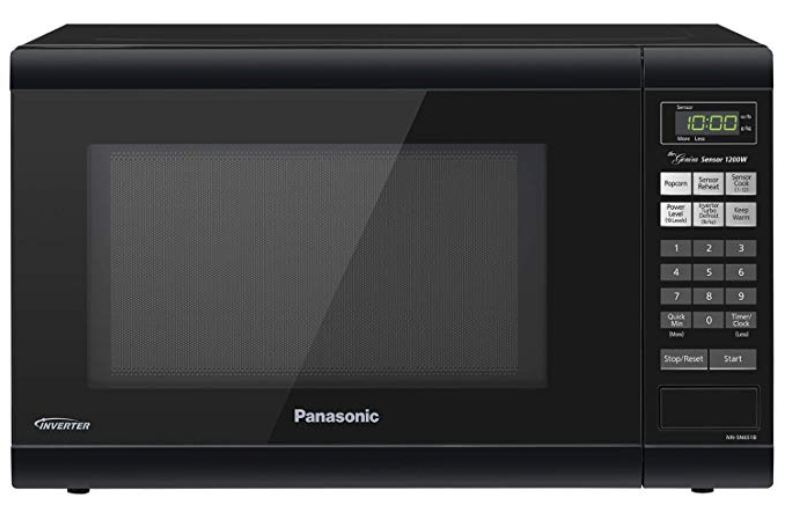 The Panasonic 651B has 12 auto cook options including soup, pizza, pasta, oatmeal, and frozen entrees. It also has one-touch controls for times when you know exactly what you need. From popcorn to “Keep Warm,” the one-touch controls allow you to have total control over your food. The Panasonic 651B displays these features on a sleek black exterior. With powerful cooking power, one-touch cooking options and a compact design, the Panasonic 651B is a perfect choice for kitchens of all sizes. At first glance, the looks sleek, stylish and high-end. The Breville Quick Touch boasts a polished stainless steel interior, fascia and door handle and an interface that features both dials and buttons. 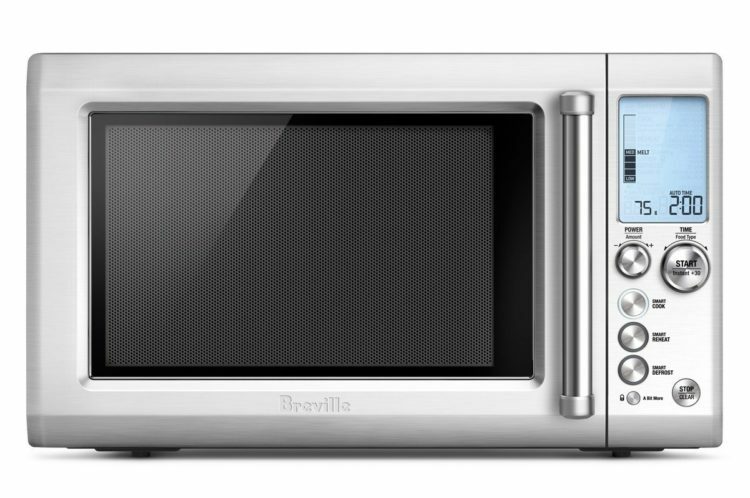 A key feature that places the Breville Quick Touch in the best microwave category is its unique and consumer-centric interface. Using the knobs, the user can adjust both power and time while the microwave is in its cooking cycle. Ten power levels allow you to adjust from 10 percent to 100 percent with the twist of a dial. Another feature that makes the Breville Quick Touch one of the best microwave options is the Sensor IQ Reheat and Cook function. This capability automatically adjusts cooking time to match the food being cooked, preventing over or undercooking. Underneath the Smart Defrost and Reheat buttons is the ‘A Bit More’ button. This button is a key feature to use when you just need just a little more time to ensure your food is thoroughly cooked. Smart Cook & Grill and Melt & Soften are also options for those who want total control of their cooking. The also sports a ‘My Favorite’ feature which allows you to program your favorite setting for one-touch use now and in the future. The Breville Quick Touch has a capacity of 1.2 cubic feet while having dimensions of 18″ x 20.5″ x 12.5.” It fits perfectly on a countertop, providing significant cooking capacity while not overtaking your counter. Its unique design will make the microwave stand out without sacrificing quality. The has the look, feel and functionality of one of the best microwaves on the market today. What if you had a microwave that could sense when your food was being heated and adjust the power accordingly? What if that microwave could do that with the push of a couple buttons? The Toshiba EM131A5C-BS combines innovative sensor cooking technology with an intuitive interface and sleek design. “This microwave’s sensor buttons take the guesswork out of reheating your favorite foods. 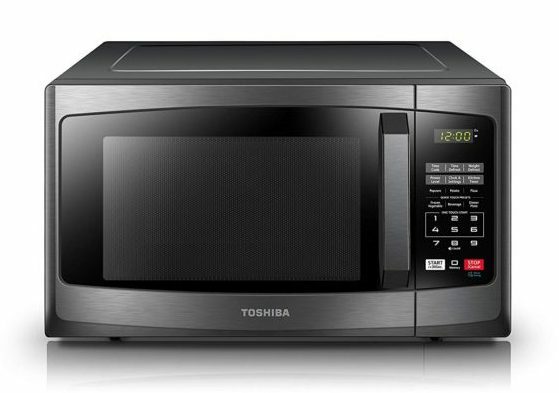 The Toshiba EM131A5C-BS senses the amount of steam produced during cooking and automatically adjusts for optimal results.” Such a feature eliminates those irritating times when you microwave leftovers only to have the outside tough and overcooked while the inside is ice cold. The Toshiba EM131A5C-BS’s pre-programmed sensor menu for optimum heating of popular foods with buttons for frozen pizza, rice, popcorn, veggies, and potatoes. With two defrost settings – custom or one-pound auto defrost – the Toshiba EM131A5C-BS is versatile and flexible to meet the unique needs of your family’s dinner. If you prefer to control the time and power, the Toshiba EM131A5C-BS has a large, easy-to-read display. Additionally, the Toshiba EM131A5C-BS has 1100 watts of power and 10 different power settings. And for those who want to heat up popcorn at night in secret, this unit has an option to mute the buzzer. The Toshiba EM131A5C-BS is of medium size at 20.5” x 17.1” x 12.8” with a 1.2 cubic feet capacity. Whether you have a large family or like to cook larger dishes, the Panasonic 936B has the size and consistent cooking power to meet your needs. At 2.2 cubic feet, it has a much larger cooking capacity than smaller models on the market. It also sports a huge 16.5” turntable and generates 1250 watts of power. 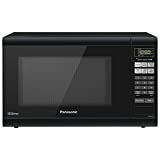 In addition to the Genius Sensor and Turbo Defrost, the Panasonic 936B features 14 auto cook options for foods such as oatmeal, pasta, pizza, popcorn, and soup. The Panasonic 936B also comes with a Keep Warm feature, allowing your dessert to remain warm until you’re ready to put it on the table. This unit’s larger size does mean a heftier weight. At 37lbs, it is not as portable as other, smaller options. However, the larger size is the perfect for a large family or a regular cooker. If you need large size with significant power, the Panasonic 936B is the perfect option. Roommates sharing a space or a young professional in their first, small apartment know that space in a kitchen can be at a premium. When you need counter space for food preparation, you don’t want to take up space unnecessarily on a larger microwave than you need. However, with the Toshiba EM925A5A-BS, you don’t need to sacrifice cooking power and quality for size. The Toshiba EM925A5A-BS is 19.2” x 15.9” x 11.5” with 0.9 cubic feet of internal capacity. To go with the smaller capacity, the Toshiba EM925A5A-BS has a 10.6” turntable. It has a black stainless steel exterior that looks sleek and high-end. The Toshiba EM925A5A-BS has ten power settings and 900 watts of cooking power. Like larger units, the Toshiba EM925A5A-BS has one-touch start options for pizza, frozen vegetables, entrees, popcorn, and potatoes. Additionally, this unit has options for defrosting, both by time and weight along with a kitchen timer. 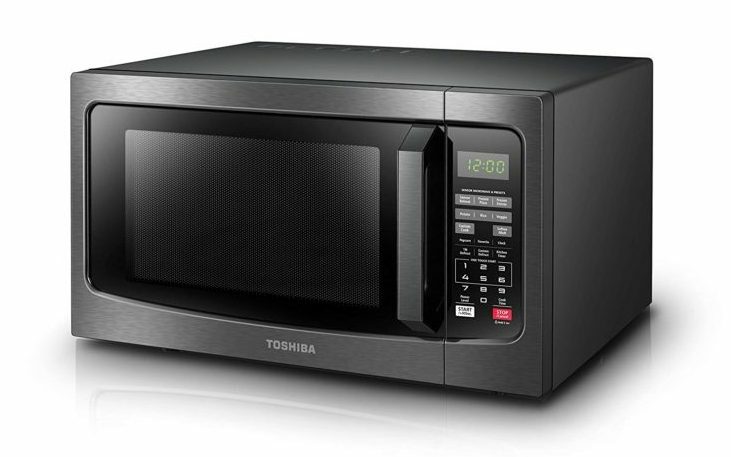 With key, reliable features in a small size, the Toshiba EM925A5A-BS is a top performer for best microwave for those with a limited space. With the invention of new technologies, components of our houses are becoming increasingly connected. From your phone, you can control the stereo, see inside the fridge and check a package at the front door. Now, even select microwaves can be accessed and controlled with the push of a button or a voice command. The is an 11½” h x 19” w x 14½” d (h x w x d) inch unit with .9 cubic feet of capacity. It has a 10.5” turntable inside, weighs a little less than 30lbs, and generates 1050 watts of power. At first blush, the stainless steel exterior and the more compact size give the impression of a high-quality unit. Like other units, it sports a respectable 900 watts with 10 power settings, clock, and kitchen timer. 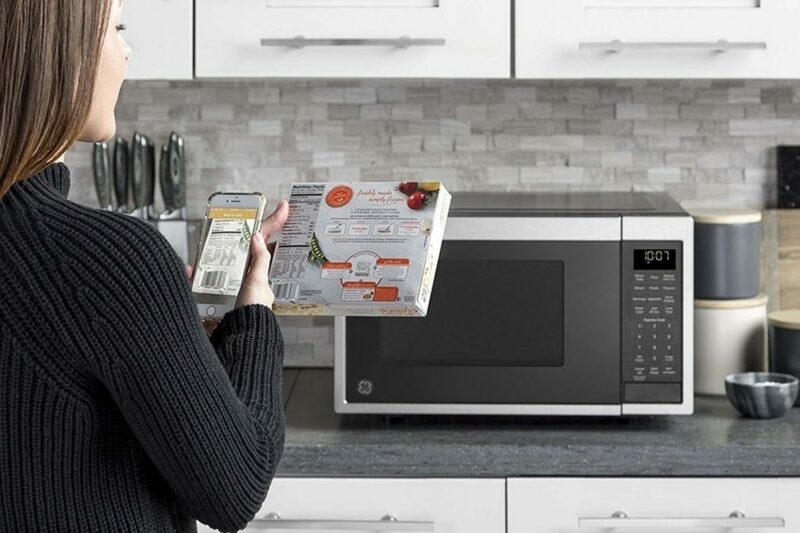 The GE JES Smart Countertop Microwave Oven has seven pre-programmed sensor menu beverage, dinner plate, pizza, popcorn, potato, reheat, and vegetable cooking settings. The GE JES Smart Countertop Microwave Oven also has an electronic touch led digital display, easy-to-read control panel, and interior led light. While all of those features would put the GE JES Smart Countertop Microwave Oven in the conversation for best microwave, this product takes features to the next level. The GE JES Smart Countertop Microwave Oven works with Alexa for voice control by enabling Alexa Smart Home Skill U+Connect. If you have an Alexa device in your home, you can speak directly to Alexa to achieve the ultimate in kitchen convenience to cook, defrost, or reheat. Voice commands to Alexa could include setting time, adding time, setting a power level and time and commanding a shut-off. It provides a hands-free way to control your food from anywhere in the house. The GE JES Smart Countertop Microwave Oven is on the cutting edge of microwave technology. By using Alexa, the GE appliances cooking app and your microwave, you can cook your food to manufacturer specifications by only putting the food in the microwave and shutting the door. Microwaves have made great strides in quality and features offered, especially over the last few years. The incorporation of inverter technology has helped resolve any issues with uneven cooking. Programmed one-touch buttons helped customers optimize their cooking to specific types of food without the guesswork. But the next steps in technology will center around integration and voice commands. Connections to Amazon’s Alexa, Google Home, and other networking devices will only deliver better connectivity and more accurate cooking. Integrations from food companies to tailor cooking instructions to their products will also help consumers remove the guesswork from getting their meal. Overall, the best microwave is the one that fits your life, your needs, and your kitchen. Before making a purchase, evaluate your own needs and space. Then, ensure your options have the features you need to make the most use of the microwave as you can. Q: How does a microwave cook food? A: It’s a complicated process but essentially, the food is heated through radiation. When running, a microwave channels heat energy right to molecules inside food. As the microwave is turned on, these microwaves bounce around inside the chamber and eventually penetrate the food as it spins. Once inside the food, the microwave molecules vibrate quickly, generating heat. The faster the molecules vibrate, the more the food is heated. In the end, the food is heated from the inside out. The spinning turntable in the chamber ensures the food is heated and cooked evenly. Q: What are watts and how many should I have in a microwave? A: Watts translate to the cooking power of the microwave. As a rule, the more watts a microwave has, the faster your microwave will cook. Additionally, the higher the wattage, the more evenly the food will cook. Normally, microwaves range between 600-1200 watts. In general, more expensive microwaves will have higher wattage. Larger units will sometimes boast more watts, like the Panasonic NN-SN936B noted above. Q: How will I know what size of a microwave to get? A: This usually comes down to a personal preference as well as the space available in your kitchen. A lot of kitchens have their microwave on the countertop. These units usually have an internal capacity of around 1.2 cubic feet, although it can get as high as 2 cubic feet. Other kitchens have the microwave above the oven range, which usually accommodates a size similar to countertops. Other kitchens can have built-in models that have a custom space made for their microwave. It really all depends on the space you have available in your kitchen. If you have a built-in space or an above-range place, you might run into restrictions with what units you can get. The best advice that can be given is to measure your available space prior to shopping so you know what size you have to work with. Q: What is inverter technology? A: Prior to this technology being invented, microwaves cooking at anything less than 100% power relied on the microwave shifting between 100% power and 0% power to average out to be your set power level. This method could often result in unevenly cooked food. Now, with the invention of inverter technology, microwaves with this feature can be set to 50% power and actually be maintained at that power level for the duration of the cooking time. This gives consumers much more power over their dishes and control over more delicate foods such as fish, eggs, or vegetables. Q: What do the one-touch programmatic buttons do? A: One touch settings are set to a pre-determined time and power level as determined by the optimal amount needed for a specific food. Pushing that button will begin what has been determined by the manufacturer as the best time and power for a specific food. Q: Are there any options for similar cookers that aren’t microwaves? A: If you’re looking for competitors to microwaves, there are products that share similar aspects as a microwave. Toaster ovens, countertop grills, steam ovens, or even propane grills are all options for anyone considering an alternative to a microwave. 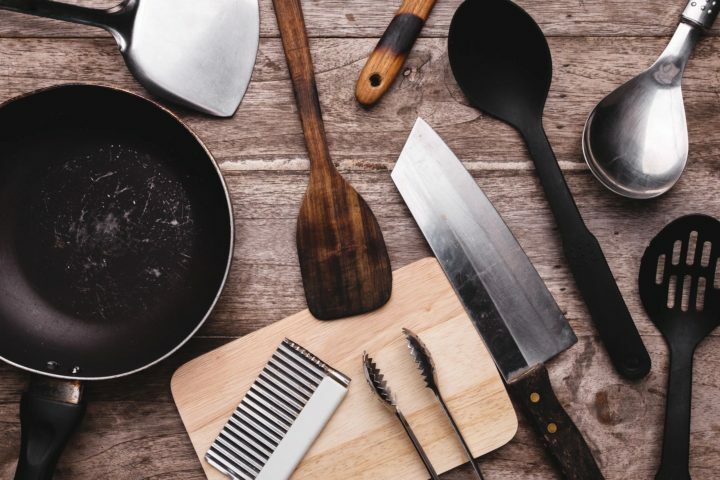 However, while all of the products heat food in some fashion, many do not bring the same level of flexibility and variety of settings to countertop cooking as microwaves. Again, these all depend on your culinary needs and space. This entry was posted in In Depth Product Reviews, Kitchen. Bookmark the permalink.